Arm levitation is a useful indicator of hypnosis and can also act as a convincer for your clients. Because the client's arm rarely lifts up spontaneously during hypnosis you will need to use specific suggestions which this script offers. 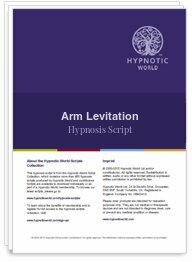 Download this Arm Levitation hypnosis script to demonstrate to your clients the effectiveness of your sessions.